The NBC10 Investigators track down a rider who admits to jamming cell phones on a SEPTA bus. The rider explains why he does it. An expert says this is a public safety concern. The NBC10 Investigators tracked down a cell phone zapper who targets people using their cell phones on a SEPTA bus route. Not only does he admit doing it, he thinks it’s a good thing. Eric says he doesn’t want to hear people talking on their cell phones in public. “It’s still pretty irritating, and quite frankly, it’s pretty rude,” said Eric. Eric says he’s firing up a cell phone jammer that he bought online to shut down conversations he doesn’t want to hear. “A lot of people are extremely loud, no sense of just privacy or anything. When it becomes a bother, that’s when I screw on the antenna and flip the switch,” said Eric. An NBC10 employee, who the NBC10 Investigators are calling “Marie,” says she freaked out when she saw the man jamming passengers’ cell phones on her SEPTA bus ride to work. 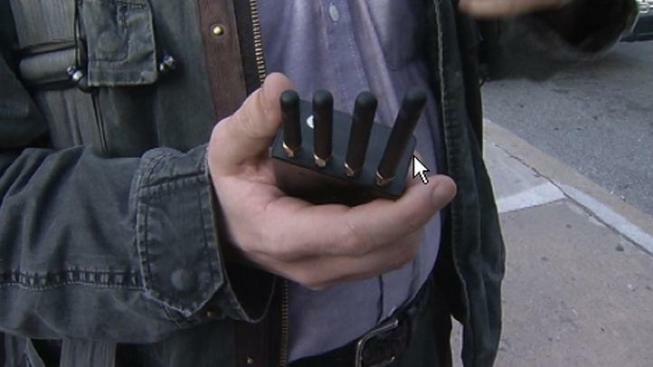 “He’s blatantly holding this device that looks like a walkie-talkie with four very thick antennae. I started to watch him and any time somebody started talking on the phone, he would start pressing the button on the side of the device,” said Marie. Marie tipped off the NBC10 Investigators who went undercover to catch the cell phone vigilante with a hidden camera. Within minutes of boarding the 44 bus, the NBC10 Investigators spotted Eric jamming cell phones. A couple of weeks later, they caught up with him as he got off the bus, and they informed him that the cell phone jamming device is illegal. “It is my understanding it is more of a gray area. It is my understanding that it’s illegal to, you know, stop a television signal, a radio signal. You know, it’s my understanding according to the FCC that it’s not illegal to disrupt a cell phone signal,” Eric said. But according to federal law, it is illegal to use, own, buy or sell cell phone jammers. The feds say breaking the law could result in jail time and up to a $16,000 fine. Cell phone jammers are illegal because of the public safety concerns. Drexel University's Dr. Rob D’Ovidio works with cell phone forensics and electronic crime. D’Ovidio says some cell phone jammers can block GPS, two-way radios and even police radio if they’re close enough. “With cell phone jammers, you are limiting all types of communication tools that use the radio frequencies. You have the potential to cause a public safety disaster. Cutting off communication by not only our public officials to their dispatch centers but also cutting off the public’s communication to 911 can be a dangerous thing,” said Dr. D’Ovidio. The NBC10 Investigators asked Eric if he was concerned about disrupting someone who is trying to get emergency help. “Well, of course if there were such a situation on the bus, I imagine I would be right in the middle of it. And I would imagine that would be a very different situation, of course; I’d imagine I’d be dialing 911 myself," Eric said. SEPTA officials say they have been getting a lot of complaints from riders on the 44 bus route about lost calls. But SEPTA insists that riders are safe, adding they’ve tested their system and it would take much more than a handheld jammer to affect it. SEPTA says all buses have a panic button. Drivers can also alert police with the digital destination sign on the front of the bus. The transportation authority says it has tested its two-way radio communication and insists cell phone jammers will not affect it. But that doesn’t make Marie feel any better. “Every time I see this guy on the bus, I have a mixture of fear and anger. Part of me wants to go up to him and say, ‘Stop doing this, how dare you,’” said Marie. Just hours after the NBC10 Investigators told Eric that the cell phone jamming device was illegal, he called to say he did more research and discovered that what they told him was true and he would dispose of the device.